Turkey has many allures, but it is no secret that the hundreds of beaches that cover its 7000-kilometre coastline is one of the biggest ones. Some of the most beautiful Turkish landscapes can be spotted along its shores, and there is loads of local culture to experience right on the sand. So, if your thinking about jetting off to the Aegean Sea, you’re probably curious about where to find the best beaches in Turkey. The truth is, you’ll be hard pressed to find a Turkish beach that doesn’t hit the spot, but we’ve still done some groundwork for you and selected our personal favourites. From family hotspots to off-the-beaten-track gems, these sandy highlights will have you booking tickets in no time. 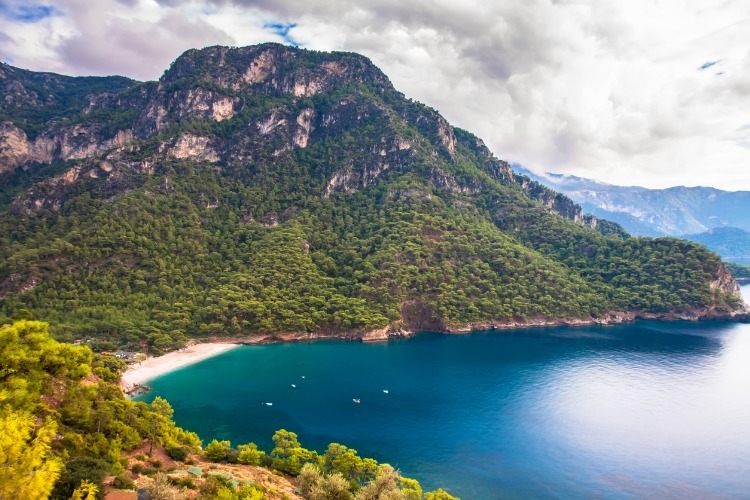 Some 25 kilometres from the resort town of Ölüdeniz, you’ll come across the bohemian village of Kabak, frequented by backpackers, yogis and nature enthusiasts. Another 30 minutes on foot will take you to the steep trail leading down to Kabak Beach. 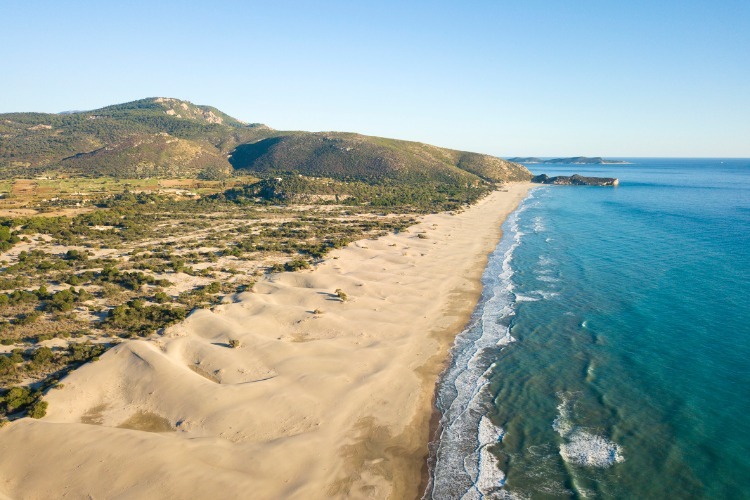 This half-moon bay, surrounded by pine forests and mountains, can only be reached by descending this trail on foot, but the serene and peaceful beach at the bottom is well worth the effort (and the views from the top aren’t too shabby either). On the pebbles and white sands of Kabak Beach, you’ll mostly be in the company of locals and backpackers travelling along the Lycian Way. You won’t find many amenities, any water sports or beach chairs for hire. The vibe is distinctively laid back, and people come here mainly to appreciate the natural beauty and undisturbed stillness. There are some shaded areas to escape from the sun with a juice or a beer from one of the beach bars. Other than that, it’s just you, the Mediterranean, and a few friendly loggerhead turtles to keep you company. 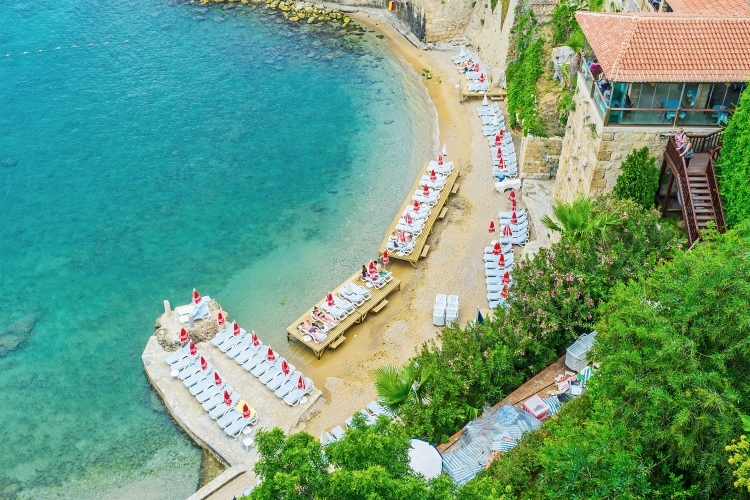 The heart of a bustling city like Antalya might not be the first place you’d expect to find one of the county’s loveliest beaches, but there it is. No more than a stone’s throw from the city centre, Mermerli Beach is a small city beach tucked away next to the old port. Since Antalya is a pedestrian-only zone, Mermeli can only be reached on foot, but there is nothing better than a spot of relaxing, sunbathing and swimming after a long morning spent walking in town. To access the beach, you pay a small fee at the entrance of Mermerli Restaurant and descend a wooden staircase from there. Included in the price are a sun lounger and parasol, and you’ll be able to have drinks, ice creams and food brought right to your seat from the restaurant. A stone plateau and wooden terraces have extended the small natural beach of brown sand and pebbles, but keep in mind that there is very limited space. 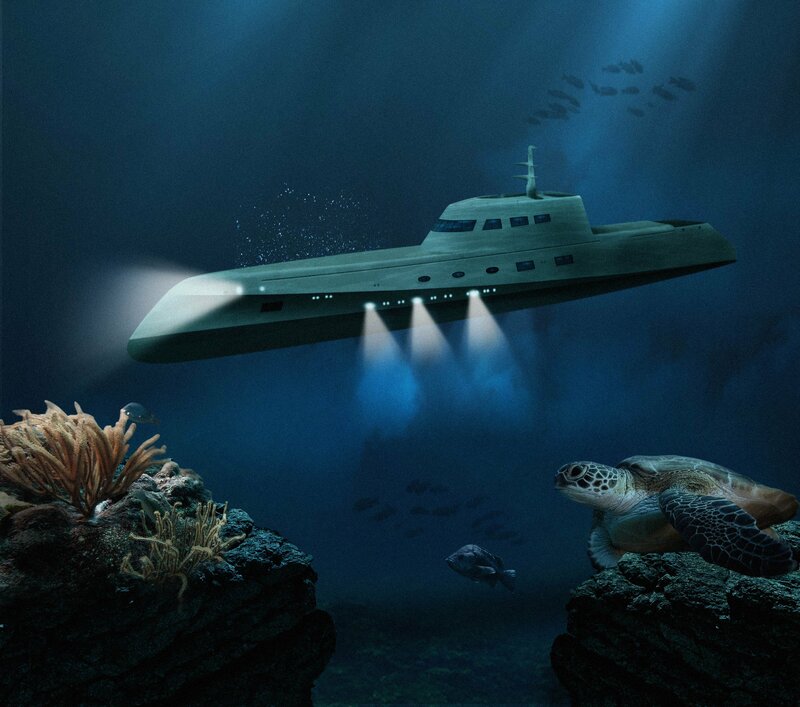 There is plenty of room in the water, though, and the sea is clear with beautiful views of the opposite coast. 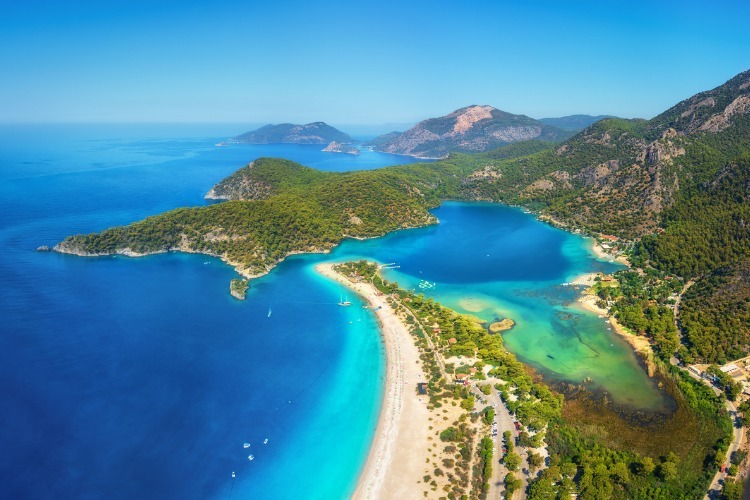 The Ölüdeniz Blue Lagoon is probably the most famous beach in all of Turkey, and for a good reason. Few places in the world match up to its natural beauty, and as such, tourists are drawn to the vibrant blue waters for a few hours of unwinding by the sea. This wide bay is located just where the Aegean and Mediterranean seas meet, inside a protected natural park, with the Babadag mountains in the background. The sands are relatively gritty, but most visitors love lounging in the shallows of the waters, which is warm and perfect for children to play safely. 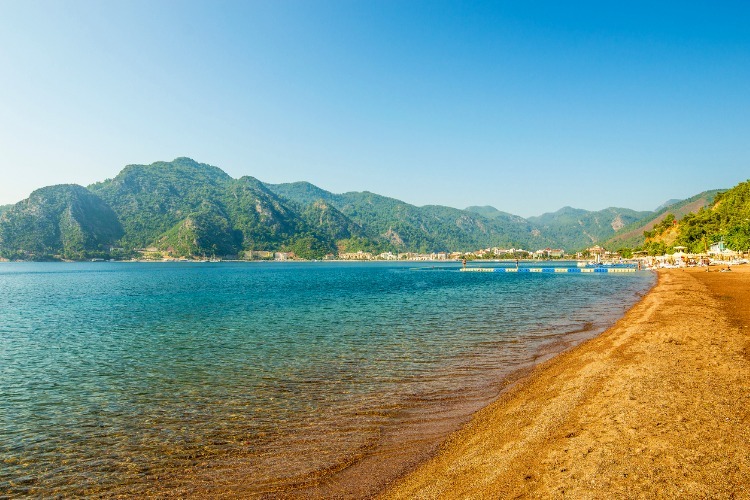 The golden sands of Icmeler Beach can be found in the resort town with the same name, just 8 kilometres from Marmaris. What was once a small fishing village is no one of Turkeys most popular seaside getaways for families and groups of adults alike. 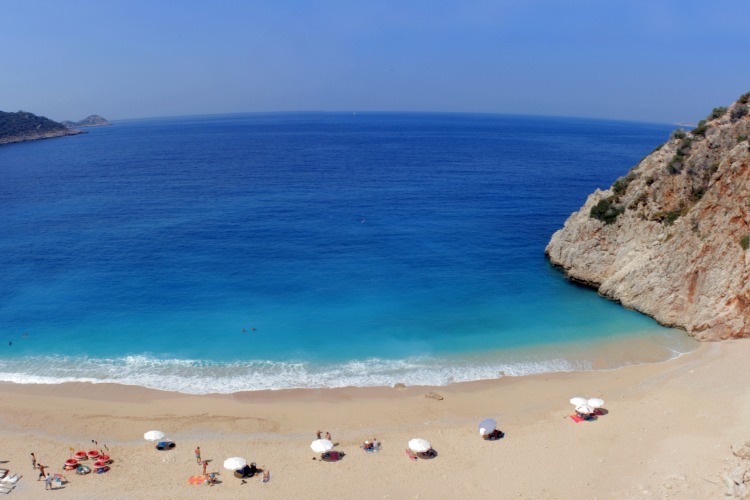 Iclemer has a surprisingly Caribbean feel for a beach surrounded by pine forests and backed by the Taurus Mountains. It probably has something to do with the 6km long stretch of sand that never feels too crowded and is cleaned every night so that it’s spotless when you arrive in the morning. Whether you’re after excitement or total relaxation, you’ll be able to find it all here, as well as plenty of bars and restaurants. The beach is calm with small waves, perfect for lounging in the sun and going on long swims. However, if water sports are your thing, everything from parasailing to jet skiing and scuba diving is on offer. There are also great hiking trails in the hills nearby, which offer up some pretty views of the beach from above. Patara Beach gets its name from the nearby ancient Lycian city Patara. To reach the beach, you have to pass through the ruins (and pay a small admission charge), but the remains of old temples, streets and arches create the perfect backdrop for this picturesque stretch of coastline and the sparkling Mediterranean Sea. At 18 kilometres, Patara is the longest beach in all of Turkey, and with minimal development, you’ll easily find a lovely spot to enjoy it in private. Perfect for long walks in the sand, sunbathing and swimming, the waters here are warm and shallow, ideal for kids and great for snorkelling. This unspoilt paradise made up of limestone peaks and rolling white dunes is also part of a national park. The local birdlife is vibrant, and the beach itself is a protected breeding ground for loggerhead turtles. Due to this, the beach has little to no development, save a small community run café where you can also rent parasols and the like. After sunset, Patara is off limits for humans, giving the turtles free range of the sand. 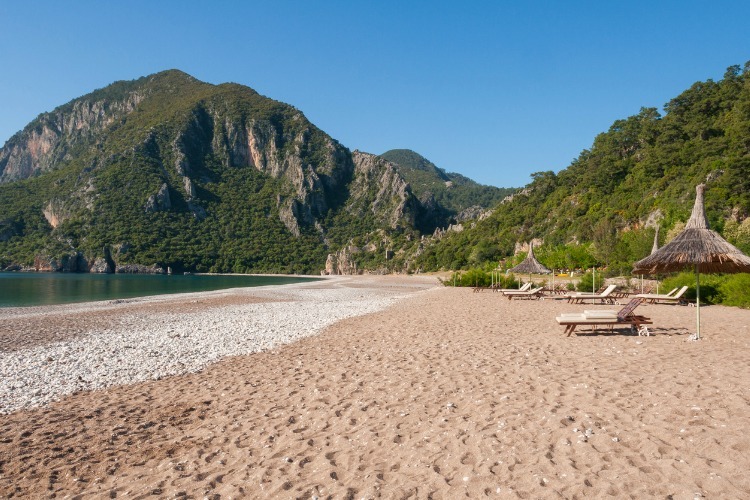 It’s hard to believe that the serene landscape of Cirali Beach is no more than an hour’s drive from Antalya. Where it lies, tucked away in the middle of the Taurus Mountains, it might as well be in the middle of nowhere. This unspoilt shingle beach is a dream spot for everyone from history buffs to nature lovers. On one end of the beach, you’ll find the epic ruins of Olympos, and on the other, the eternal flames of Chimaera. On the sandy stretch between these two iconic sites, the endangered loggerhead turtles return to nest in a WWF-protected conservation area. Visitors can delight in the crystal-clear waters, and in having lots of space to themselves. Cirali isn’t the most accessible place to reach unless you know where it is, but that means there are rarely any crowds. And as it is a protected area, development is kept to a minimum. You won’t be bothered by loud beach bars of water sports (save some sea kayaks) – just a handful of restaurants, sun loungers and a picnic area. A strong contender for the title of ‘Most Beautiful Beach in Turkey’ is Kaputas Beach, just off the coastal road between Kas and Kalkan. The stunning beach is set beneath two forested cliffs, at the mouth of Kaputas Canyon. To reach it, you have to make your way down a staircase of 187 steps, but don’t forget to stop and marvel at the view from above and join many others in memorialising it on camera. Once you’ve made your descent; you can sprawl out on a sunbed atop the pale pebbled sands and enjoy swimming and snorkelling in the clear turquoise waters. If you’re visiting with children, you can calmly let them play in the shallows, and take full advantage of the modern amenities that are a recent addition to Kaputas Beach. While popular with both locals and tourists, you don’t need to worry about too many crowds. There tend to be just enough visitors to keep the beach cafés running (including our favourite Turkish pancake shack). 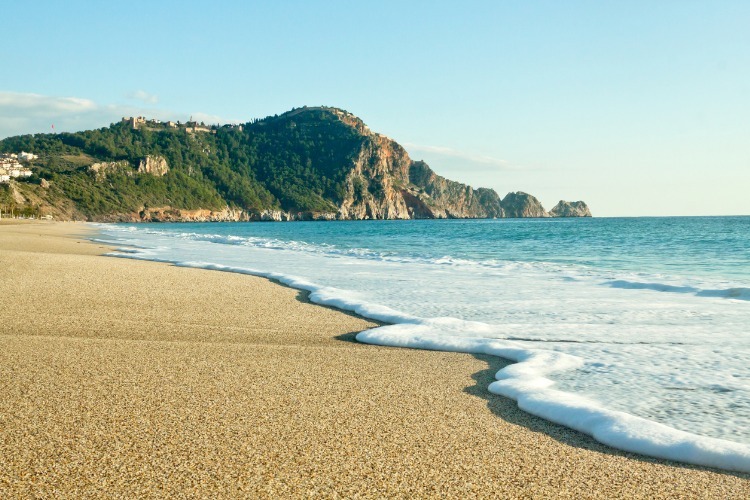 What is probably the most popular beach with holidaymakers in Turkey, Cleopatra Beach can be found right in the city centre of Alanya, in the foothills of its iconic medieval fortress, Alanya Castle. This 2.5 kilometre stretch of fine sand got its name from Queen Cleopatra herself, who is said to have fallen in love with the beautiful bay on a journey of the Mediterranean. After seeing the deep blue waters for yourself, you’re sure to understand why. This spotlessly clean beach is lined by a picturesque walkway and all the shops, cafés and restaurants you need to spend all day on the beach. With over two million visitors every year (not to mention all the boat trips that stop off here daily), there are certainly amenities to match, and families may relax knowing that there is even childcare on offer. The waters at Cleopatra Beach are warm and perfect for swimming. With some pretty large waves, water sports are always a good option, including surfing and paragliding. Butterfly Vallet, or Kelebekler Vadisi, is a hippie paradise in Fethiye most frequented by campers and backpackers who enjoy connecting to nature and revelling in the friendly atmosphere. It’s a place where people come to live simply, and the locals work hard to ensure that this ethos is preserved. But don’t shy away from Butterfly Valley even if you’re not interested in spending the night in a tent or eating communal meals at the campground. Anyone who wants to experience the breath-taking natural beauty of this beach should do so. 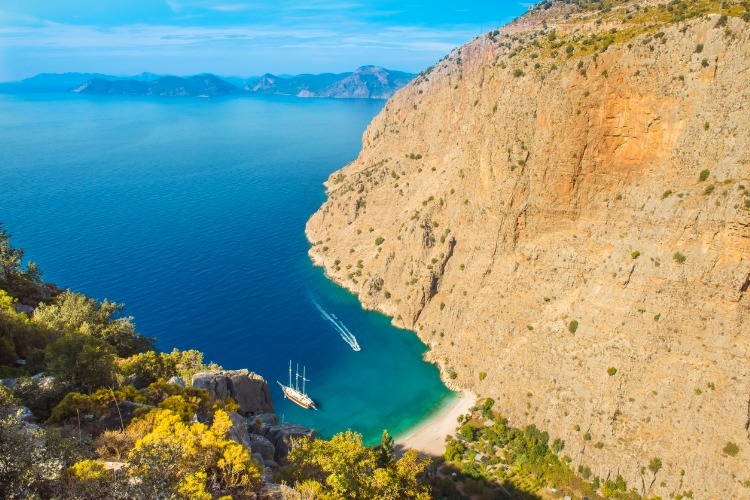 Accessible by boat from Ölüdeniz, or a very steep hike best left to veteran climbers, Butterfly Valley is located a bit off the beaten track. It is a picture postcard cove of turquoise water, white and white sand backed by the Babadag Mountains. There are plenty of great hiking trails around, some of which lead to hidden waterfalls in the hills. The valley was named after its native 100-some species of butterflies, but the little critters are shy of noise and not so easily spotted these days. With the freshwater River Delta on one side and the salty Mediterranean Sea on the other, İztuzu Beach is a unique stretch of sand that reaches 4.5 kilometres from end to end. There is very minimal construction on this beach, much to conserve its natural beauty and the important turtle habitats here. 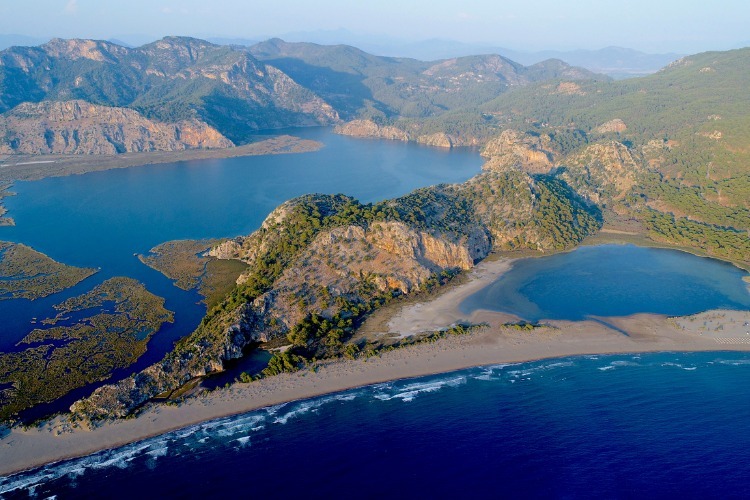 Iztuzu Beach is one of the most prominent nesting spots for loggerhead turtles in Turkey, which is why it’s also sometimes referred to as Turtle Beach. 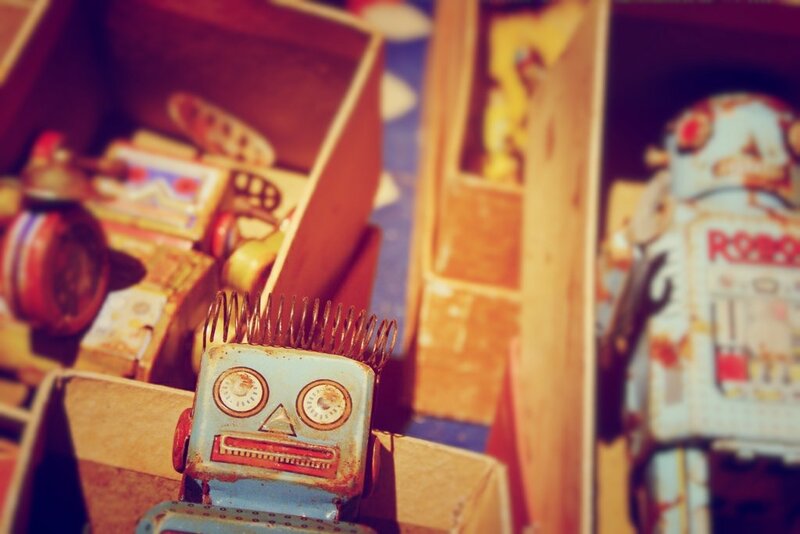 For this reason, it’s only open from 8 am to 8 pm during summer, leaving nights to four-legged visitors. Visitors love Iztutu for its soft golden sands and pine-covered, hilly surroundings. The water is excellent for swimming and surfing, and there is plenty of room for privacy on the sand. Not many tourist crowds have made their way to this beach, but there are a handful of cafés to will keep you in tea and pancakes. If you’re curious to explore more of the area, you can also take a short boat trip across the river mouth, to a small shady beach on the other side. With all this talk of beaches, you’re probably wondering where to find the best home-base for all your explorations of the Turkish coast. Well, having a look through our expansive online portfolio of villas in Turkey is a great place to start. If you have any questions or need some help with your search, our friendly concierge team is always on hand as well.